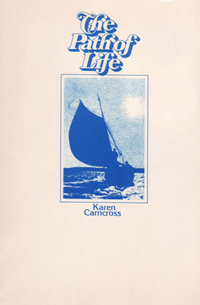 Karen Carncross, a Sunday school teacher at Saint Barnabas Episcopal Church on Bainbridge Island, authored a booklet with the title The Path of Life (1977). Carncross takes passages from the Bible and thoughtfully reflects on each passage as well as on life in general. The text is printed in beautiful calligraphy and drawings compliment the writings throughout the book.